I sit in that chair often — several mornings a week at least — listening to the morning bird calls, inhaling the perfume of the Southern Magnolia flowers. It’s a serene, shady spot on my back deck that provides an excellent view of the bird feeders and the floodplain beyond the fence. Imagine my surprise when I stepped out there this morning to find the deposits left overnight. Click on the photo to enlarge it if you like. 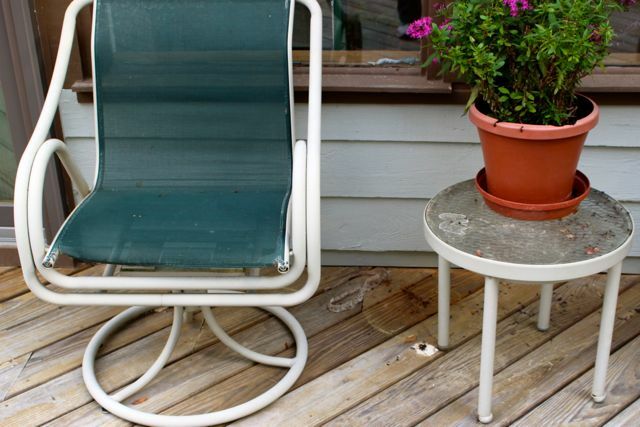 Do you see what looks like a large splat of bird poop beside the table leg? And the pile of — something else — beyond? 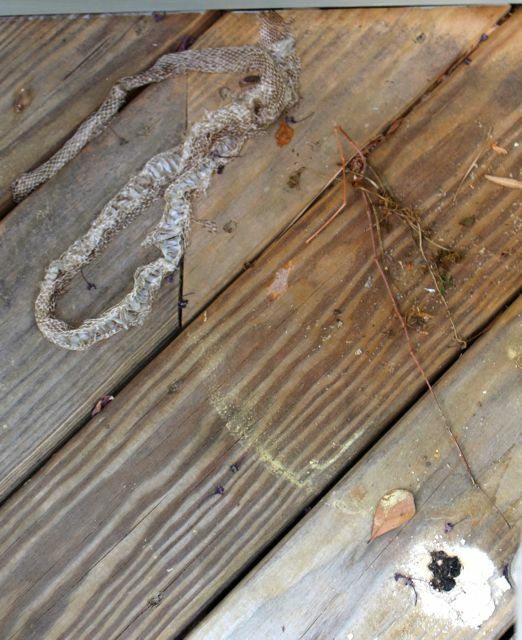 Yes, that’s a freshly shed snake skin. And I’m pretty sure that pile of poop is what the snake deposited before it decided to rid itself of its former exterior. I’m hoping the dark pellets in the center of the poop are concentrations of vole fur. It seems only fair that if a black snake is going to make itself this comfortable so close to my home that it repay me in exterminated voles. Large black snakes — Black Rat Snakes, I believe — live all around our five acres, and we are delighted to have them. Several are at least 3 feet long. This one appears to be a smaller one, only about 2 feet long. We periodically startle each other as we’re going about our respective tasks. I always thank them for their help, wish them well, and find somewhere else to be. They generally glower at me until I’m out of sight. It’s a relationship that works for us. But now, I’m wondering if these reptiles are getting a little too comfortable with me. I mean, really — pooping and shedding right where I sit most mornings? Seems a bit rude to me. Another 8 inches of tail section is tucked into the crack beneath the section you can see. The head is at the top right of the photo. On the other hand — or should I say scale — perhaps this is their way of letting me know they’re around and on the job. Predator patrol on duty, ma’am. Relax and enjoy the view. This entry was posted on May 30, 2015, 11:11 am and is filed under Native Wildlife, piedmont gardening. You can follow any responses to this entry through RSS 2.0. You can skip to the end and leave a response. Pinging is currently not allowed. 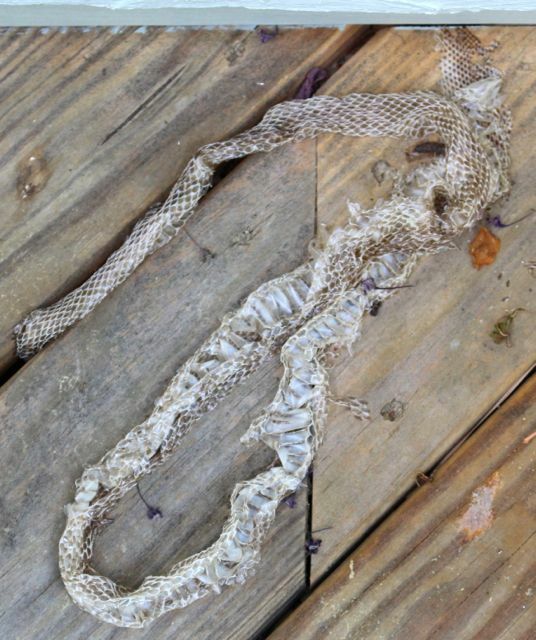 I would be glad to have a black snake skin rather than the live copperhead that was lurking in my compost pile a few days ago. My husband along with a shovel got to make the next trip. no more sandles for trips out there for sometime! Since the snake was on the other side of the fence, I went inside to get my new camera to capture a photo. i knew the viper head, but wasn’t sure of the coloration. I have it now!! Welcome, Mary! I don’t wear open-toed shoes in my yard ever. I just don’t feel adequately defended that way. I’m glad you are OK.
Congrats on the new camera and your instinct to photo-document your encounter. I think it does help to keep such records.